The new year is fast approaching……….please have a Happy New Year!! Attached is information about the 2018 Cross Timbers District Day Camp……….Passport to Adventure! We would like as many Cub Scouts as possible to join us! We need one person from each Pack that will be a Day Camp Liaison, preferably a Pack Committee position. Our goal is to have one person that is the contact for Day Camp and is responsible to see that all forms are 100% complete. Please send the name of that person to Chris. Also, please send him the dates for your Blue and Gold, and your Pinewood Derby, so the Day Camp committee can visit with information. We also need help finding Red shirt Volunteers (Boy Scouts and Venture crew) to work Day Camp. 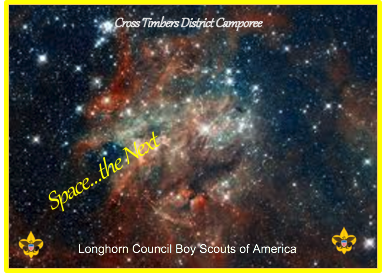 We will need a Scoutmaster for the Red shirts as well…..any suggestions? We need as many adults as possible, helping at Day Camp, to be CPR/AED certified. BSA/Day Camp standards are “at least 50% of staff be certified”. We will announce some classes in March soon, with Robert Palmer from Longhorn Council, at Trinity or St.Barnabas UMC. Please let us know if your Pack plans to participate. Your Day Camp Committee is hard at work planning a great week of Adventures! Thank you for all that you do for Scouting! After the BSA Board of Directors' historic decision to welcome girls into Scouting, many in the Scouting community had just one question: When can my daughter sign up? Other Scouters had more specific questions about the reasons for the move, implementation and rollout plan. On Oct. 30, Bryan Wendell, senior editor of Boys' Life, Scouting, and Eagles' Call magazines, asked Scouters to submit their questions for BSA Chief Scout Executive Mike Surbaugh. By the time he recorded the video, he had received more than 400 questions. He took a representative sample of 22 questions directly to our Chief, who spoke openly and candidly for nearly 30 minutes. For the best experience, watch the complete video of the discussion. As I write this article, two months after Hurricane Maria caused so much damage to Puerto Rico, still just 46% of the electric service has been restored on the Island. Normal, everyday life is a challenge. I had the honor of serving as the Scout Executive of Puerto Rico Council for six years, from 2000 through 2005. One of the achievements I am most proud of is that I was able to give leadership to rebuilding Camp Guajataka, the only camp owned by the Council. They call it their Santuario de Amistad, or Sanctuary of Friendship. Unfortunately, the camp and council service center were both heavily damaged by the storm. As does all of the Island, Puerto Rico Council needs a lot of help to get back to being operational, and we all can help if we choose to. Please see the attached link that will give you the opportunity to purchase patches that will benefit Puerto Rico Council financially. As of November 16th, more than $32,000 worth of patches had been purchased, but much more help is needed. Its done! Thank You and Congratulations. The Longhorn Council had a very successful campaign. As a group Popcorn sales rose 9.4%. Mustang District under Erik Lloyd's leadership grew substantially. As did Frontier Trails.Thank you to all the units and District Kernels who spent time promoting and coaching. Over $537,000 was raised by local Scouting units to support their programs and youth. Many Scouts rely on a springtime sale to raise the needed funding for Cub Scout Day Camps, Boy Scout Summer Camp or special high adventure activities, including Philmont. This year there will be two options for units to choose from. Both of these can be found on www.scoutfund.net. More information will also be provided at January Roundtables. The Longhorn Council conducts a managed deer hunt every year on three weekends in November and December at Lakeview Lodge on Sid Richardson Scout Ranch. The hunt is done in cooperation with Texas Parks and Wildlife as an annual harvest to manage the deer population on the camp. A limited number of slots are open for the third weekend of the hunt, December 8-10th. The hunt complies with all Texas game laws, beginning on Friday evening and ending on Sunday evening. Game tags are furnished by the camp and not from the hunter's licesnse. Any firearm or archery equipement lawful for the taking of deer in Texas is acceptable. The hunt is for a buck or doe (buck tags are still available). An additional tag is available for a $50 fee. Limit is one buck per hunter. Bucks must have antlers that extend beyond the ears (approximately 13" spread). Hunter(s) will be assigned ground or tree stands. The stands accommodate more than one person (for parent/child). Includes all accommodations and meals at Lakeview Lodge from 3:00PM Friday afternoon through sunset on Sunday evening. Meals include a BBQ Brisket supper and a steak supper where each guest cooks their own 1 1/4" thich T-bone or Ribeye steak. William installed a pergola and picnic table as well as landscaping for the Animal Birth Control Clinic in Beverly Hills. William hopes his contribution will offer a comfortable place to sit for those with pets seeking treatment and for volunteers of the clinic. Each team of 3-6 Cubs gets a Cub-O map half an hour before the race starts. Your goal is to hike in the woods and find as many of the 40 orange and white orienteering flags as you can. Plan your strategy to score the maximum point total possible in 2 hours! Map training sessions for Cub Scouts and parents are held all morning. NESA put up for auction on eBay a very special guitar from the Jamboree. The auction closes Saturday at 1:45pm! Woodbadge Beading Ceremony for two Longhorn Council Staff Members: Bryant Butler and Chip Blomgren! Test your skills at our Winter Camp Merit Badge Program at Lakeview Lodge or at our U.S. Cavalry Living History Camp at Sid Richardson Scout Ranch. There's no shortage of fun to be had! Enlist as a soldier in the 4th U.S. Cavalry on the 1870's Texas frontier. Fire carbines, cannons, and Gatling guns in battle reenactments of the Red River War of 1872-74 and the Civil War 1861-65. Our youth and adult staff are expert reenactors and certified artillery instructors who have participated in many of the largest Civil War battle reenactments in the country, including the 150th anniversary Gettysburg battle. Help Scouting Families in need at your local Longhorn Council Scout Shop. We want to allow every family the opportunity to be involved in Scouting. Please help your neighbors and fellow Scouts by visiting a local Scout Shop and supporting the Ethan Giving Tree.